MusicWonk produces MIDI music based on algorithmic rules you interactively create by connecting modules (graphical objects representing functions and processes) in real time, adjusting the parameters as you go, in an interactive drag & drop environment especially designed to be fast to learn, fast to use. Not a set of canned me-too riffs or rules, but an open ended palette of composing modules to powerfully boost your creativity. ...... powerful algorithmic composing programs available. MusicWonk will drive MIDI synthesizers, soft synths and sound cards directly, effectively "playing" them in real time; MusicWonk will also record directly to a standard MIDI file. MusicWonk is essentially the same program as ArtWonk, but without the animation graphics components. 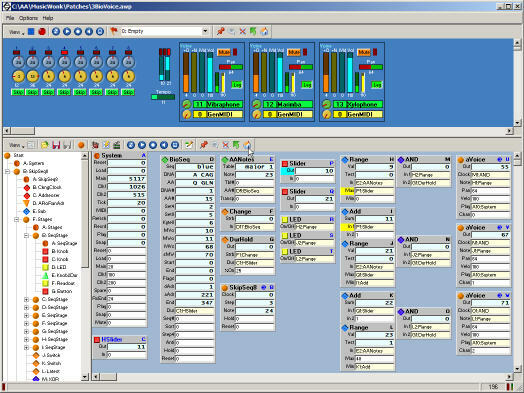 It is the successor to a long line of graphical, modular, and interactive algorithmic composing programs created by John Dunn that were inspired by the big analog modular synthesizers, going back to one of the first if its kind ever produced for MIDI, MusicBox, released to the public domain in 1986. Qweas is providing links to MusicWonk 4.1.1616 as a courtesy, and makes no representations regarding MusicWonk or any other applications or any information related thereto. Any questions, complaints or claims regarding this application MusicWonk 4.1.1616 must be directed to the appropriate software vendor. You may click the publisher link of MusicWonk on the top of this page to get more details about the vendor.